The Beatroot writes on his blog how The Daily Mail, in its zeal to prove how ruinous has been recent immigration by new EU members like Poles, will go to any lengths – including giving people money to break the law - and staging evidence of lawbreaking for its "investigation". This came to light when Daily Mail journalist Sue Reid contacted Beatroot, who lives in Warsaw, and offered him a cash payment of £800 plus his expenses, to bring his girlfriend's foreign-registered car over to England to be photographed breaking British traffic regulations. 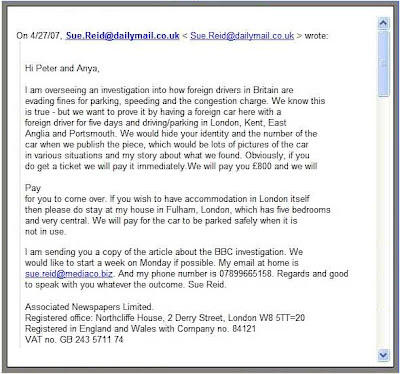 Since then, we have obtained a copy of the e-mail from Sue Reid, setting out the offer and, revealing that she wanted to "prove" how foreign drivers in Britain were "evading fines for parking, speeding and congestion charge". We have published the full text above (click to enlarge) as it came to us. Mail journalist Sue Reid has been active for her newspaper, writing motoring stories and also filing a number of "shock-horror" exposés about Polish immigrants, following in the footsteps of her paper which has, since last year, been enthusiastically seeking out "the truth" about the effects of Polish immigration. 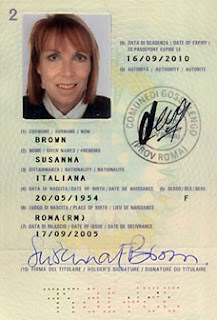 She, herself, is no stranger to "sting" operations, having last year bought three forged passports (pictured) to "demonstrate" the "staggering scale" of a fake passport scandal which has allowed immigrants to seek entry to Britain. But now, in an attempt to prove her point once again, she has been actively soliciting foreigners to break the law so that she can write her story. The fact, as she claims, that foreign drivers are evading British traffic regulations may be true but, as Neil Herron writes, it is also true of British drivers in ever-increasing numbers (an estimated 2.1 million cars are untaxed – compared with 1.2 million in 2004). In seeking to fabricate evidence in support of her narrow – and inflamatory – thesis, Sue Reid has stepped over the line. Her journalistic practices are no different in principle to the media condoning the staging of photographs in the Qanagate affair, on which we reported last year. In fact, Reid has gone that bit further for, while at Qana, scenes were staged by third parties for compliant journalists to photograph, here she is actually setting up the scenes so that Mail photographers can capture the "evidence" for her paper. Such malpractice, in furtherance of stories about a highly sensitive issue like immigration, goes beyond the pale. There are serious issues to do with our EU membership, enlargement and the mass-migration of central and eastern European workers to this country – but this sort of crass manipulation simply poisons the well of debate and makes rational discussion that much more difficult. And once again this demonstrates how essentially dishonest are certain sections of the MSM, which have no regard for honesty and decency in the pursuit of a story. And on these, we rely for our information?